Jaishankar was previously a Transatlantic Fellow with the German Marshall Fund (GMF) in Washington DC from 2012 until 2016, where he managed the India Trilateral Forum, a regular policy dialogue involving participants from India, Europe, and the United States. From 2009 to 2012, he was programme officer for Asia with GMF. 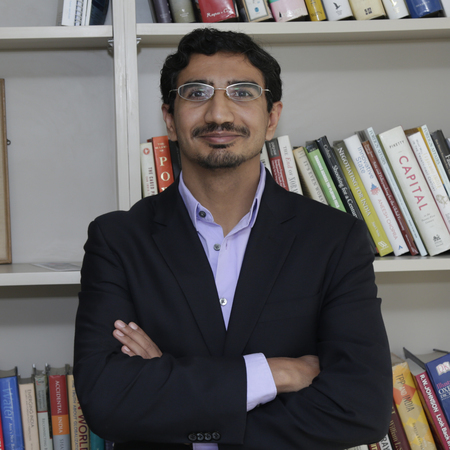 Prior to that, he worked as a research assistant at the Brookings Institution in Washington and as a news writer and reporter for CNN-IBN television in New Delhi. In 2015-2016, he was a Visiting Fellow with the South Asia Programme of the S. Rajaratnam School of International Studies at Nanyang Technological University in Singapore. Jaishankar holds a bachelor's degree in history and classics from Macalester College, and a master's degree in security studies from Georgetown University. He has been a David Rockefeller Fellow with the Trilateral Commission, an IISS-SAIS Merrill Center Young Strategist, and a Brent Scowcroft Award Fellow with the Aspen Strategy Group. o “Indian Strategy in a Non-Strategic Age,” in India Now and in Transition (Niyogi Books, 2017). o “A Confluence of Two Strategies: The Japan-India Security Partnership in the Indo-Pacific,” in India and Japan: Assessing the Strategic Partnership (Palgrave, 2018). o “India as an Asian Power,” in Seven Decades of Indian Independence (Penguin, 2018). o “Indian Ocean Region: A Pivot for Indian Growth,” Indian Ocean Conference, 2016.
o “India and the United States in the Trump Era: Re-Evaluating Bilateral and Global Relations,” Brookings Institution, 2017.
o “Survey on America’s Role in the Indo-Pacific,” (with G. Flake, S. Jackman, et al. ), Asian Research Network, 2017.
o “Uneasy Triangle: India’s Evolving Relations with the United States and China,” Perth U.S.-Asia Centre, 2017.
o “U.S.-India Task Force,” (with N. Rao, R. Verma, et al. ), Center for American Progress, 2018. Jaishankar holds a bachelor’s degree in history and classics from Macalester College, and a master’s degree in security studies from Georgetown University. He has been a David Rockefeller Fellow with the Trilateral Commission, an IISS-SAIS Merrill Center Young Strategist, and a Brent Scowcroft Award Fellow with the Aspen Strategy Group. Fellow, Foreign Policy Studies, Brookings Institution, Washington D.C.
Transatlantic Fellow, German Marshall Fund, Washington D.C. Program Officer for Asia, German Marshall Fund, Washington D.C.
Research Assistant, Brookings Institution, Washington D.C.
Brent Scowcroft Award Fellow, Aspen Institute, Washington D.C.
[While China was initially focused on former premier Nawaz Sharif’s Pakistan Muslim League-Nawaz, or PML-N,] Beijing has diversified its contacts and investments in Pakistan... Khan does not have a lot of wiggle room...We may continue to see a gradual trend of Pakistan drifting closer to China and more distant from the United States. But that would have to do with a number of factors beyond Imran Khan’s election.